We install Air Cleaners/Purifiers, Humidifiers & Dehumidifiers, Thermostats, and more in the Dillsburg, Mechanicsburg, Camp Hill & Boiling Springs PA area to keep you and your family in a healthy environment. We have done much study in the area of "Indoor Air Quality" and have weeded out many of those "outrageous claim" products. We install Air Cleaners/Purifiers, Humidifiers & Dehumidifiers that actually work. We provide Energy Conservation services. As much as half of the energy used in your home goes into heating and cooling, so making smart decisions about your home's heating, ventilating and air conditioning (HVAC) system can have a big effect on your utility bills, and your comfort. We can show you how to reduce your utility costs. Is one room too warm and another too cool? There is a solution! It's called Zone Control. A home not zoned will leave someone uncomfortable somewhere in your home. 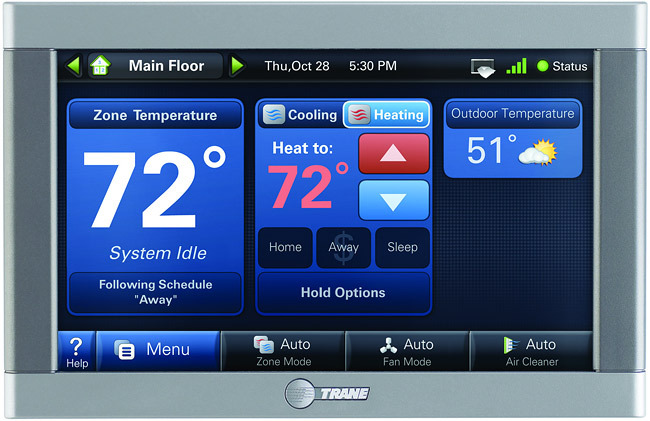 It's too much to expect of one thermostat to provide perfect conditions for every room in your home. What is comfortable for the sleeping area may be uncomfortable for the living area and vice versa. A home not zoned also costs you more in heating and cooling costs. Why sacrifice comfort, spend more money, and waste more energy? You no longer have to! Zoning is your answer. A zone-controlled home requires no special attention on your part... simply set the temperature in each zone to your desired comfort level and your system does the rest. Zoning divides your home into areas with common heating and cooling requirements. Each zone is controlled by its own thermostat, allowing you to be comfortable no matter where you are in your home. Zoning also allows you to leave unoccupied areas without heating or cooling, saving you more money on energy costs. In addition, a zone system can be used with a variety of night setback thermostats. If you're still using an old-fashioned thermostat, we strongly recommend upgrading to a Programmable Thermostat that allows you to program the temperature in your home at different times of the day. This saves a lot of energy because you can keep the temperature warmer in the summer and cooler in the winter on days and times that you will not be home. It also keeps your home more comfortable and the perfect temperature for when you come home from work, vacation, etc.